Provide a moving boundary to the combustion reaction space, and thus enable useful work to be extracted from the combustion gases. Its movement also provides a means for gas transfer and compression. 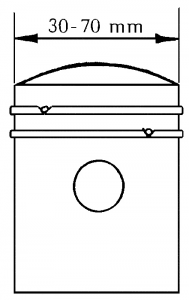 Transfer the cylinder gas pressure force to a piston rod or the small end of a connecting rod. Guide the movement of the small end of the connecting rod in engines where this is directly connected to the piston. The control of the leakage of compression and combustion gases in order to prevent loss of working pressure, the blowing away of the piston lubricating film and possible overheating of the piston. In the case of pistons which are splash lubricated from the low pressure side, the control of the loss of lubricating oil via the cylinder bores into the combustion chamber. Provide a path for the transfer to the cooled cylinder liner, of some of the heat which enters the piston from the combustion gases. 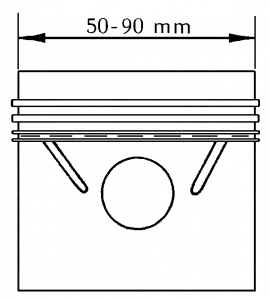 The design of the piston and the ring arrangement varies with the engine type and size, and some typical piston assemblies are shown in Fig.1. It will be seen that these vary quite noticeably in the proportions of the piston, and in the design of the ring pack, but all have gas sealing rings towards the high pressure end of the piston, and many have oil scraper rings towards the low pressure end. Two-stroke petrol engines are generally small, and usually have pegged rings to prevent the tips of the rings becoming trapped in ports in the cylinder wall. They operate on petrol oil mixtures, and the small amount of oil that is present, and the total loss nature of the feed system, does not require scraper rings to be used. The stroke of these engines usually needs to be greater than an equivalent four- stroke engine in order to get adequate crankcase compression, and the maximum connecting rod obliquity can therefore be greater, which calls for a slightly longer piston for greater stability. Four-stroke petrol engines are mainly used in passenger cars where silence is important, and therefore usually incorporate various features such as suitably shaped slots aimed at controlling the clearance between the piston skirt and the cylinder bore. Since this type of piston is splash lubricated from the crankcase some form of scraper ring, and at least one taper faced scraping gas ring, are usually needed to control the oil consumption. Four-stroke diesel engine pistons are considerably more robust than those used in petrol engines, having heavier metal sections and larger sized gudgeon pins. With Aluminium pistons the top ring groove is often lined with a nickel alloy cast iron insert to reduce ring groove wear, and give a longer piston life. For the same reason the top ring is usually chrome plated in all engines with cast iron cylinder bores. Oil consumption is particularly critical, and it is common practice to use two oil scraper rings as well as two taper faced downwards scraping gas rings in the second and third positions. As diesel engines become larger, thermal stress becomes more of a problem and the pistons are usually internally cooled with oil. To ease the problem further in medium to large trunk piston engines, a separate steel piston crown is often used. In the largest two-stroke diesels as used for marine propulsion, water cooling is usually incorporated and the pistons are usually mounted on a piston rod with a separate crosshead to carry the connecting rod side thrust. The whole piston and cylinder assembly is then kept separate from the crankcase, and is independently fed with oil metered through cylinder lubricators. There are generally five or six plain iron compression rings to spread the lubricant and share the wear. This inevitably occurs with these marginally lubricated arrangements, and is accentuated by corrosive and abrasive products from the residual fuel oils which are commonly used in this type of engine. 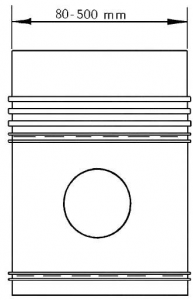 The usual design procedure for piston assemblies is to start with one of these typical designs, and then to determine its critical detail dimensions from the various formulae quoted in the next sections. In the case of pistons for mass produced smaller engines, a substantial proportion of the design and development work is usually carried out by the component manufacturers. This enables them to build up a large amount of useful practical experience which they can incorporate in their designs. The pistons for larger engines tend to incorporate more design work by the engine builders, and they may in some cases construct test rings to prove various aspects of the performance of the pistons before incorporating them in an engine, particularly if they include any new design features. Almost invariably, modifications are made to piston and ring arrangements after development tests. These may involve detail changes to the outside profile of the piston to obtain improved bedding patterns, changes in the ring pack to control oil consumption, or any other modifications necessary to cure defects found during engine testing. 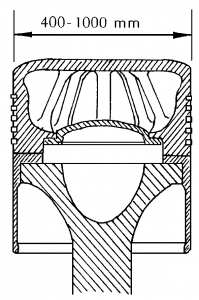 Scuffing during initial running has been a particularly difficult development problem in recent years, but has been substantially reduced in incidence by the choice of better ring materials and the better control of the initial surface finish of the cylinder liners, and the condition of the edges and surface profiles of the piston rings. The detailed shape and dimensions of the piston are determined largely by the need for adequate strength and stiffness in the load carrying components, together with suitably shaped sections for the conduction of heat. 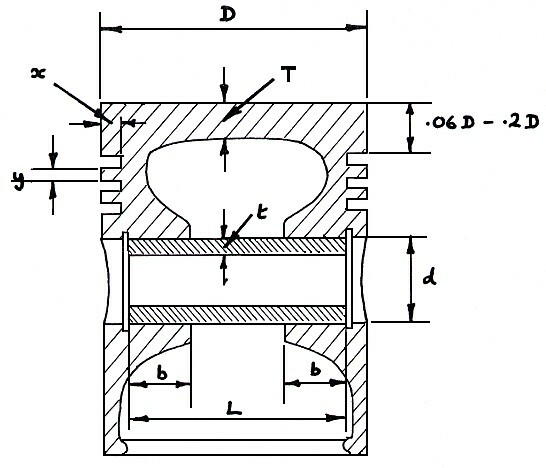 A number of empirical formulae are commonly used for determining the key dimensions of the main load carrying components, such as the thickness of the crown, the necessary bearing area in the gudgeon pin bosses, and the dimensions of the gudgeon pin. It is also important to ensure that the piston ring lands are strong enough to support the gas loads transmitted from the piston rings. The cold clearance between the piston and the cylinder varies along the length of the piston, and for light alloy pistons this cold diametral clearance usually varies from about 0.007D at top land to about 0.0015D at the skirt. For cast iron pistons the cold diametral clearance usually varies from about 0.0035D at the top land to about 0.001 D at the skirt. where the notation is as shown in Fig.3. 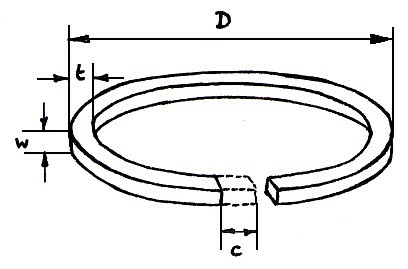 The required elastic pressure, therefore, gives some guide to a suitable relationship between ring radial thickness and the free gap in the ring. Other major and related factors which determine the allowable radial thickness and free gap of the ring, are the bending stresses which occur in springing the rings over the piston, and fitting the rings into the cylinder. In practice, values of t/D range from about 1/25 to 1/35 with the latter values tending to apply to larger engines. The axial width W tends to be determined by a compromise between satisfactory bedding to the cylinder liner, friction between the lower face of the ring and the piston land, and the balance between inertia and gas forces around the TDC position of the piston. Since piston rings usually wear to a barreled outer profile during the running-in process, a ring which is very wide could require an excessive amount of material to be removed with possibly a greater risk of scuffing. Any tendency to top edge bedding can also have serious effects with wide rings, due to the high radial forces which can be generated under this condition of pressure balance and this, again, can cause scuffing problems. On the other hand, if the axial ring width is made too small the radial pressure forces could, in some circumstance, have difficulty in moving the ring radially against the friction generated by the axial pressure forces, between the ring and piston land. In practice, values of w/D range from about 1/15 to 1/75 with the latter values being used on larger engines. The cross-section of gas rings can vary from a simple rectangular type to a double or single taper sided (keystone or half keystone) form. Taper sided or keystone rings tend to give better resistance to ring sticking from oil deposits in the grooves. Rings with stepped backs are also used to induce torsion in the ring on installation so as to give a taper running face. A large number of profiled running faces are also used, generally consisting of tapered or stepped faces intended to control the direction in which the oil is scraped from the cylinder surface. Oil scraper rings as such are fitted in grooves with drain holes, and have perforated or open cross sections to allow oil to flow through them from the running faces to the groove drain holes. Scraper rings usually have two lands of narrow axial width with elastic contact pressure in the range 150-300 psi, and are usually of less radial thickness than gas rings so that they can conform to the cylinder bore more readily. The most common cylinder liner material is cast iron, but chromium plated liners are also used for increased resistance to wear and corrosion. Cast iron liners need to be finished with silicon carbide hones, although diamond hones can be used for initial cuts. A finish in the range 20-40 micro-inches cla with a 60% plateau area is generally satisfactory. Chrome plated liners usually require a porous finish consisting of channels or pits which can be produced by honing and back etching. The most common piston ring materials are flake cast irons, but nodular cast irons are also used on highly rated engines because of their superior strength and ductility. The nodular irons do not have as good surface properties as the flake irons, however, and usually require some form of surface coating to improve their scuff resistance. Sintered irons are also being used in increasing quantities because of their noticeably improved scuff resistance. A variety of surface coatings are also available for applying to the running faces of piston rings. Electroplated hard chrome is the most widely used, but only in cast iron bores. Molybdenum sprayed coatings are about the best coatings for scuff resistance, but tend to oxidize and break up in long life applications. Plasma sprayed coatings of mixed carbides have also been successful. The running faces of piston rings may also be filled with bronze inserts or with iron oxide powder in a silicate matrix, again intended for increased scuff resistance. Tufftriding and phosphating of cast iron also helps to ease scuffing problems during running-in. A thin final surface layer of copper plate is also sometimes used, particularly on chromium plated rings to help in obtaining a good gas seal until the main coating itself is fully bedded in.